You get the benefit of the compression at the level of your comfort. I utilize bars on the ceiling above to maneuver through a variety of techniques using my foot to ease all of your tension away. This ancient technique of massage brings an end result of overall relief and deep relaxation. - I always use high quality professional lotions. 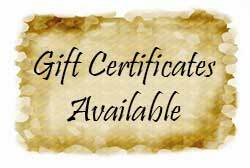 with a Massage Gift Certificate!